Note to conservatives: Want to know the best way to find savings in government assistance programs? Here’s a hint—it’s not by cutting nutrition assistance to working people who are struggling. It’s by paying them fairly for their labor. A new report from the Economic Policy Institute indicates that raising the federal minimum wage to $12 by 2020 would lift wages for more than 35 million workers nationwide and generate about $17 billion annually in savings to government assistance programs. This report shouldn’t come as a surprise. In contrast to the stereotypes and lies about people with low incomes, the reality is that a majority of public-assistance recipients either have a job or have an immediate family member who is working. In fact, 41.2 million working Americans—or 30 percent of the workforce—receive means-tested public assistance. Nearly half of them work full-time. Not surprisingly, workers who receive public assistance are concentrated in jobs that pay low hourly wages, like the retail, food services, and leisure and hospitality industries. 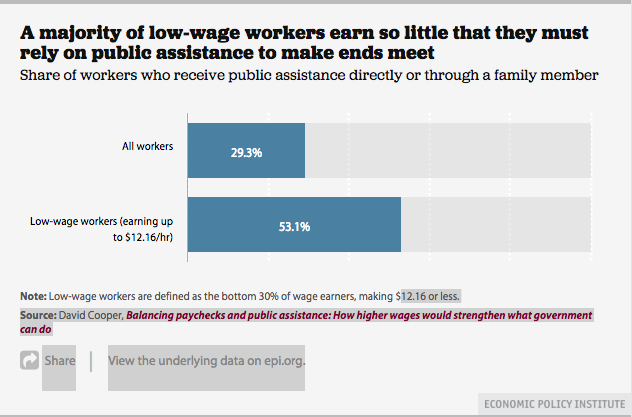 A majority (53 percent) of workers earning $12.16 per hour or less—or the bottom 30 percent of wage earners—rely on public assistance. As wages go down, the percentage of workers relying on public assistance gets higher: 60 percent of workers earning less than $7.42—only slightly higher than the $7.25 federal minimum wage—receive some form of means-tested public assistance. Overall, 70 percent of the benefits in programs meant to aid non-elderly low-income households—programs like food stamps, Medicaid, and the Earned Income Tax Credits—go to working families. The fact is that the people we expect to work are working (if they can find employment), but they are not being paid enough to make ends meet. 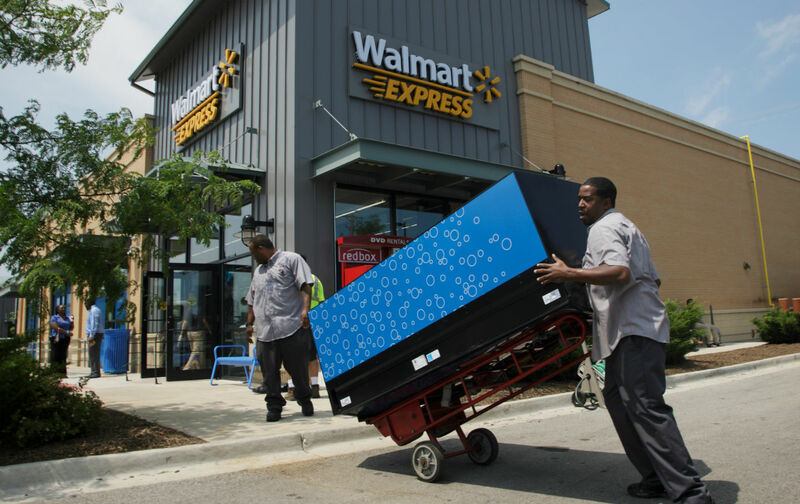 While big corporations are achieving extraordinary profits and executive compensation continues to rise, often these same corporations and CEOs are paying such low wages that workers must rely on public assistance. That means taxpayers are effectively subsidizing wealthy companies to cover the gap between what workers earn on the job and what they need to support themselves and their families. If we want low-income families to have a decent life and the opportunity to thrive, we need strong government assistance programs, but we also need to take a close look at what workers are being paid and how we expect businesses to treat them. There are many things we can do to stop subsidizing wealthy corporations for paying lousy wages. One obvious solution is to raise the minimum wage. Congress hasn’t lifted it since 2009—today it’s worth 24 percent less than in 1968, adjusted for inflation. The average minimum wage worker is more educated and more productive than in 1968, but she is paid less for her labor. Even raising the wages of the bottom 30 percent of workers by just $1 per hour would result in $5.2 billion in public assistance savings each year. And the $17 billion in annual savings realized by raising the minimum wage to $12 by 2020 could be used to strengthen anti-poverty programs—such as expanding the Earned Income Tax Credit (EITC) to childless adults, or improving access to childcare and preschool for children from low- and moderate-income families, or make long-overdue investments in infrastructure. A fundamental part of the American dream is that if you work hard, you should be able to get ahead. When we let the minimum wage and other labor standards erode to the point where hard work is no longer enough to provide families a decent life, we don’t live up to the promise of that dream. Subsidizing those who are responsible for non-livable wages only adds insult to injury. David CooperDavid Cooper is an Economic Analyst at the Economic Policy Institute. His work focuses on the minimum wage, state labor markets, poverty, and wage and income trends.